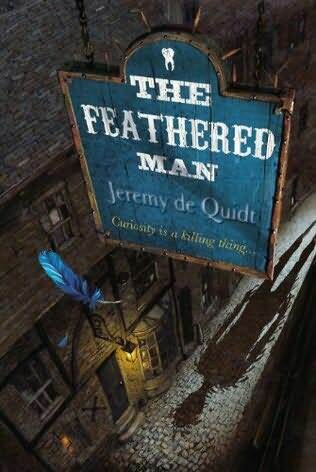 "The Feathered Man" by Jeremy De Quidt. Something wicked this way flaps! Darkness and devilry abound in Jeremy De Quidt's latest book "The Feathered Man". Set in a German town (the exact time period is never mentioned but seems to be around the 18th century perhaps), it's a roiling tale of avarice and greed, and sinister beings. We meet Klaus, "The Tooth Puller's Boy" who is drawn into the centre of a maelstrom of chaos after a cadaver arrives at his master's business (Tooth pulling was apparently common practice in Europe from the 17th Century onwards, as precious metals were used as fillings - and obviously harvested back by illicit individuals when the person died!) This particular cadaver has a few gold teeth but it's a diamond - disguised as a tooth - that causes uproar, and soon results in the tooth puller's death when an avaricious boarding house owner and her son (the dead man's landlady, in fact) want that diamond back. Drawn also into the plot is Leisl, who is a servant girl under Drecht's harsh instruction. Tortured and threatened into reclaiming the diamond back from Klaus, Leisl meets other nefarious characters who cross her path and are also very interested in that diamond. Worst of all though is a character whom Klaus encounters by chance, a terrible feathered supernatural being who seems to be inextricably linked to the gem and the deaths of several folk involved with it. De Quidt's dark and horrific story is a real slow burner at first, taking a while to get going before it gets its nasty bird-like talons into you and hooks you in. As the plot tightens, the characters - reminiscent of horrific Bosch-like caricatures - become almost frenzied as the novel draws to a satisfying 'whump' of a close. Close the shutters, close your mouth, hug the bedclothes tight - but don't close your eyes for a second!